Convective mass flow in Earth’s mantle drives plate tectonics and determines exchange rates of energy and material with Earth’s surface and atmosphere. Geophysical observations provide increasingly detailed constraints on flow patterns in the mantle. For instance, seismic tomography provides imaging of fast and slow seismic velocity regions in the mantle, possibly indicative of descending slabs and ascending plumes and seismic anisotropy observations near the boundary regions of Earth’s mantle are most likely related to mass flow induced deformation. However, a detailed interpretation of these large-scale observations in terms of mantle flow patterns requires the synergy of geophysical observables with information from mineral physics and large-scale numerical models. From laboratory deformation experiments, we can extract material properties, such as plastic strength (viscosity), which are key input parameters for numerical models. We can also derive information about slip systems that operate at conditions of Earth’s mantle and produce a lattice preferred orientation of crystals (texture). These data can be combined with single-crystal elastic properties to model seismic anisotropy observations and ultimately link them to patterns of mantle flow. We are studying the development of microstructures, textures and stresses in single phases and phase assemblages. 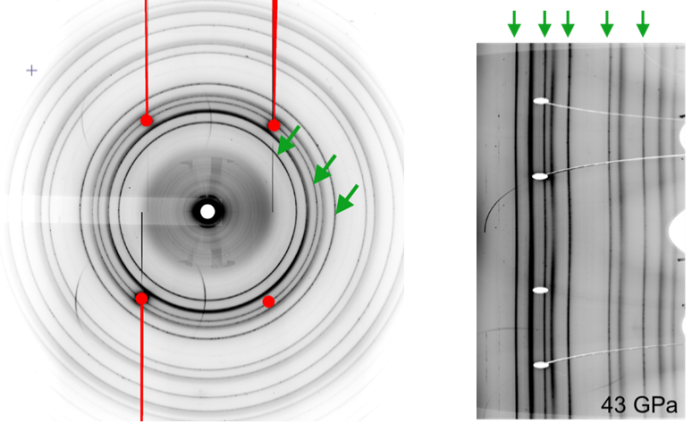 This work is performed both by in-situ synchrotron radial x-ray diffraction (rXRD) and ex-situ FIB-SEM work. Radial XRD allows for monitoring the texture and stress development of materials to pressures and temperatures relevant to the deep Earth. 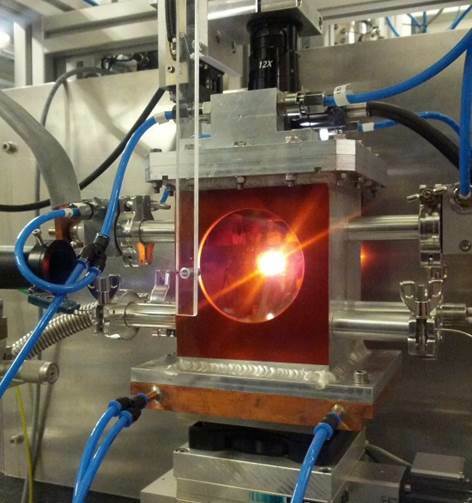 Since a few years, we closely collaborate with Hanns-Peter Liermann (beamline scientist at the Extreme Conditions Beamline at PETRA III, DESY Synchrotron) and Lowell Miyagi (University of Utah) in an attempt to reliably perform rXRD deformation experiments at high pressures and simultaneously high temperatures (image above). By combining our experimental data with elasto-visco-plastic self-consistent modelling (EVPSC), we can extract slip system activities, this is done in collaboration with Sebastién Merkel (Lille) and Lowell Miyagi (Utah). X-ray diffraction image collected at 27 GPa and 1300 K after the synthesis of CaSiO3 perovskite from wollastonite. All visible lines are from either cubic CaSiO3 perovskite or the pressure marker platinum. Selected lines from CaSiO3 perovskite are highlighted by green arrows. The red areas mask diamond diffraction peaks (right) Unrolled diffraction image after deformation of cubic CaSiO3 perovskite at 1300 K. Green arrows highlight the diffraction lines from CaSiO3. The curvature of the lines is a measure of the accommodated elastic strain, whereas the intensity variations along the lines result from texturing. Lin, F.; Merkel, S.; Hilairet, N.; Marquardt, H.; Immoor, J. *; Tomé, C.; Miyagi, L.: Elasto-visco-plastic self-consistent (EVPSC) modeling of periclase deformation at high pressure. In preparation for Journal of Applied Physics. Marquardt, K.; De Graef, M; Singh, S.; Marquardt, H.; Rosenthal, A.; Hiraga, T.; Koizumi, S: Quantitative electron backscatter diffraction data (EBSD) analyses using the dictionary indexing (DI) approach: overcoming indexing difficulties on geological materials. In press, American Mineralogist (Link).